Western Australia - Interim period: 1901-1917. Heading and notes: Form number E. T. 1. Size of form overall: 210 × 233 mm. Size of datestamp box: 24 × 29 mm. a scan of the only known sheet of the Telegram seals is shown below while a block of 6 is shown in conjunction with the corresponding Victorian form. In many countries, telegraph forms had been designed so that, when folded, they incorporated an envelope. There had long been the view held by some in the Australian Chief Telegraph Offices - even since 1893 in New South Wales - that a single form which incorporated an envelope would be more efficient and reduce errors in processing. That view is despite the fact that few errors were made - as is noted in various Annual Reports. 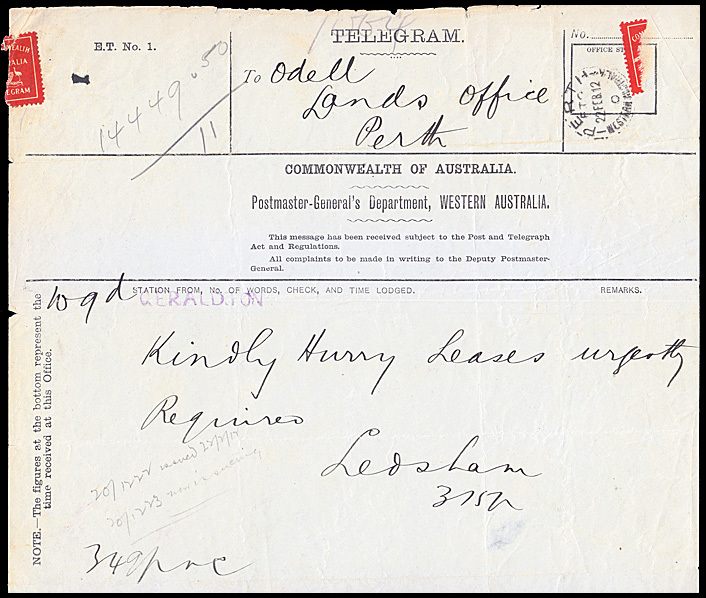 In 1912, a prototype form and envelope was trialled in at least two Chief Telegraph Offices. The only recorded example for Western Australia is shown below while the only recorded example for Victoria (VI-DO-4) is included elsewhere. The forms, after folding, were sealed with a specially printed C of A Telegraph stamp (or seal) which would be torn in two on opening. The concept was later developed further into the first delivery form issued by the Commonwealth without State references for both ordinary rate (AE-DO-1) and urgent rate (AE-DU-1) delivery forms. (Rare PERTH E.T.O. date stamp of 22 February 1912). Also has a unboxed GERALDTON hand stamp. has two lines of vertical text at left. This particular form was long regarded as being the only genuinely used example of this format known for any State. Another form has since been identified for Victoria (see VI-DO-4). The only recorded sheet of the Telegram seals known to be still in existence. 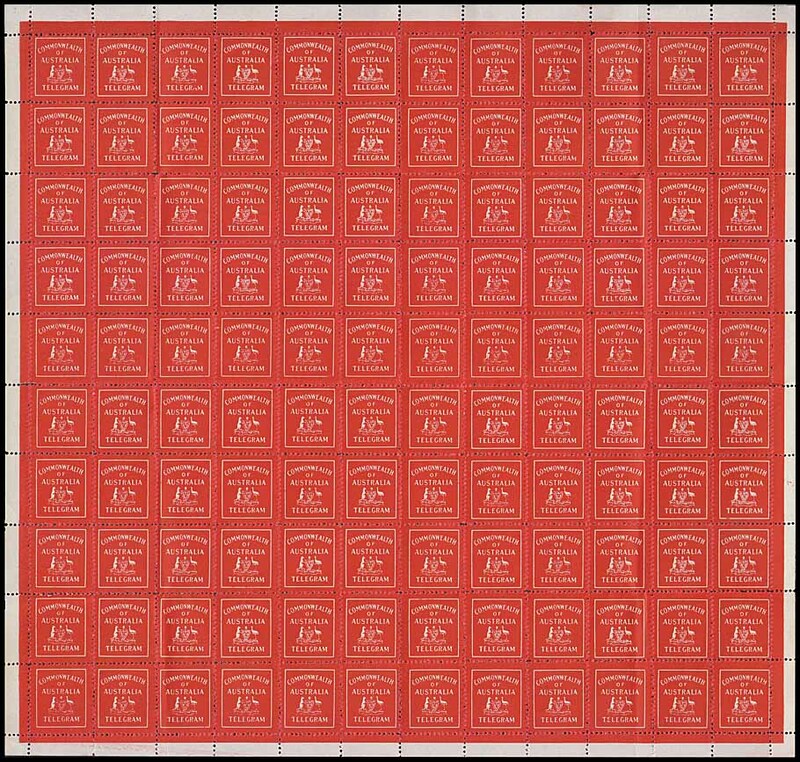 Tasmanian Stamp Auctions April 2015. A block of 6 seals is shown in conjunction with the corresponding Victorian form (VI-DO-4). Previous WA Interim period delivery form (WI-DO-3). Next WA Interim period delivery form (WI-DO-5). Overview page of all WA Interim forms.